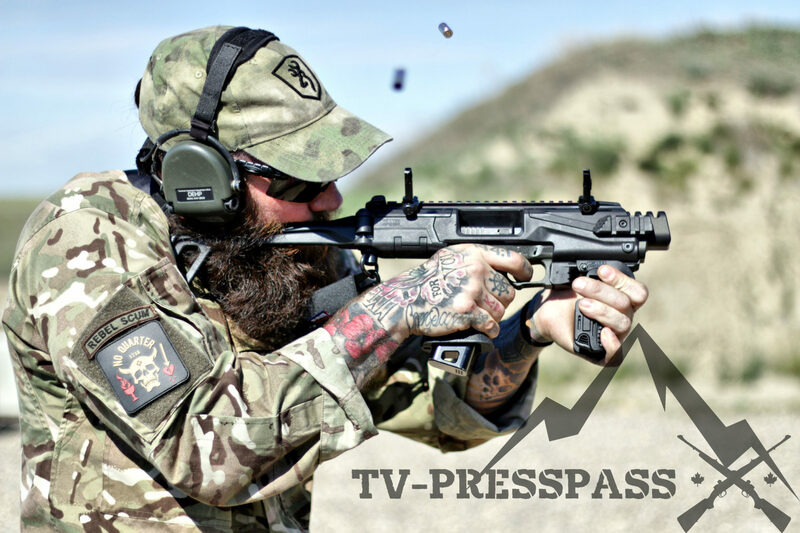 The FAMAE Firearms Family is a product of the Chilean state-owned manufacturing company Fábricas y Maestranzas del Ejército and the Swiss Arms company, formerly Sig Sauer. The Chileans have licensed the original Sig540 design to outfit their armed forces. This platform from the 1970s has been adapted into many variants with specific weapons for military and police use. They cover every base: large 7.62×51 designated marksman rifles, solid 5.56 assault rifles, short barrelled paratrooper carbines, 9mm sub-machine guns, snub-nosed personal defense weapons, and even police-specific options chambered for the World War II .30 carbine round. Some of the semi-auto variants are exported to Canada, where they find a welcome home in the gun-starved north. 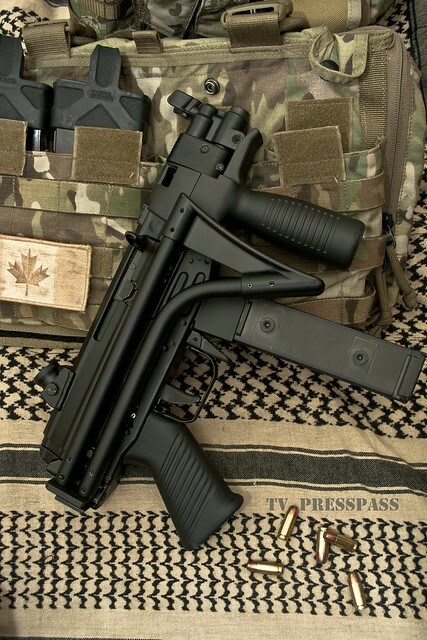 You see, during the 1990s Canadian Parliament banned a number of scary-looking assault rifles outright. Essentially anything used in an action movie during the 1980s became prohibited. All kalashnikov variants? Gone. The FN-FAL? Gone! MP5s, G3s, and almost all those other popular military rifles were banned outright. Even the AR-15 was relegated to a restricted status, meaning that they must be transported under lock and key, and can only be fired at a range approved by the government. There is no bush plinking or varminting up north with America’s favourite firearm. Firearms that managed to avoid our politicians narrow-minded fear are always a reason to get excited. The FAMAE SAF Mini becomes the MP5K I will never own. The SAF Mini that I’m best acquainted with has a 4.5” barrel, a saw-style rear grip, the classic H&K style foregrip, a folding stock, diopter sights, an ambidexterous safety and magazine release, plus a picatinny rail add-on for optics. 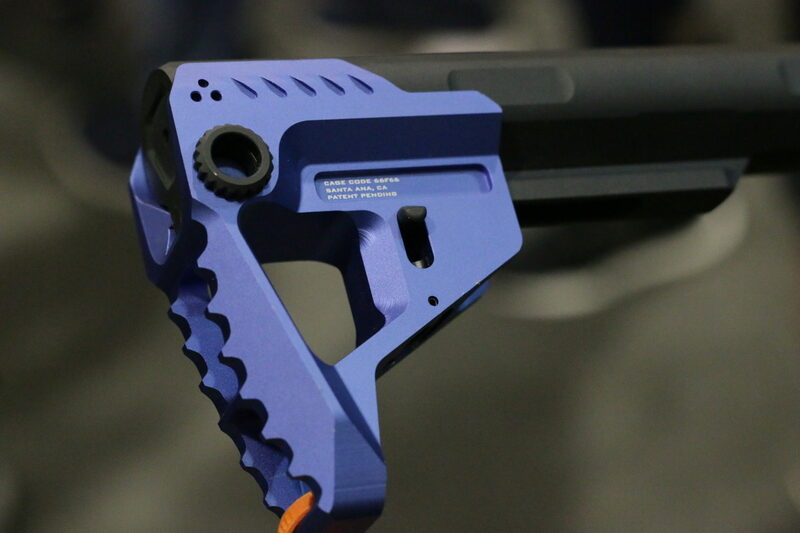 They are a great PDW that is ready to go right out of the box. These guns really are a beauty to behold. The SAF uses polymer double-stack magazines that come from Chile in 20 or 30 round sizes. Of course they end up being pinned to 5 to comply with Canadian law, but interestingly the 30 round magazines can be snapped together redi-mag style. This modular magazine system is something carried over from the Swiss Arms 550 rifles, and in theory you can stack as many as you feel comfortable with. But: FAMAE is not Sig Sauer. These aren’t Swiss machinist-made, these are stamped steel. Some of the welds aren’t as nice at the sights and grips. Parts have to come up from Chile, and proprietary magazines are expensive. But considering a SAF is right at the $2000 mark, and a Swiss Arms rifle can push up past $3600, you would expect to see differences. The next big thing to come from FAMAE into Canada will be the SG542. This .308 battle rifle features an 18.5″ barrel, and is a unique option for anyone looking for a semi-auto in this caliber. Non-restricted .308 black rifles are a rarity in Canada. 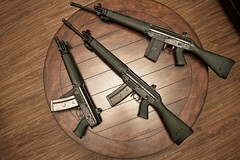 Your options are: M-14, Robinson Arms XCR-M, or Kel Tec RFB. That’s all there is. So the arrival of a Swiss-designed, South American-made rifle is a welcome addition. I’ve had a limited hands-on with one, but having put a few rounds down-range I am seriously considering it as a DMR role rifle. It uses an integral bipod, with a pinned flashhider and bayonet lug. Once again, these use a proprietary rock-in magazine, not dissimilar from FAL or M14 magazines. 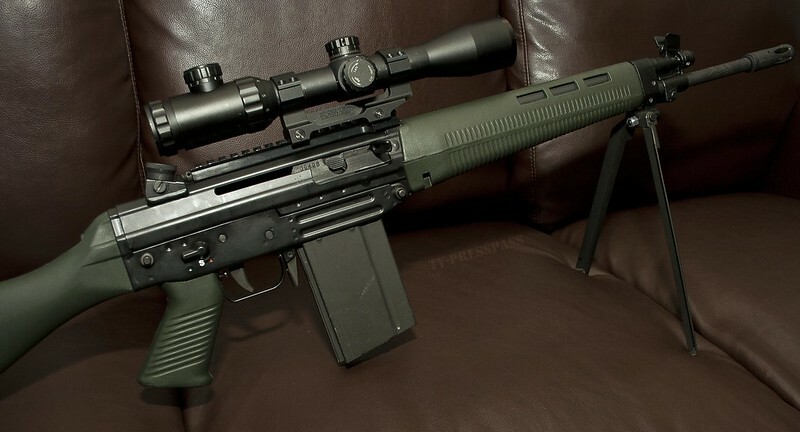 They have an adjustable gas system with settings for “clean” “fouled” and “rifle-grenade.” The SG542 is substantially lighter than the XCR, and does not have the optics mounting issues associated with an M14. The SG542 is slated to arrive on Canadian shores en masse this fall, and hopefully we will see more imports from Chile’s manufacturer in the coming year.